When the alarming truth broke regarding hydrogenated/partially hydrogenated trans-fats, shortening and margarine-makers came out with products that are "trans-fat free." Actually, the amount of killer trans-fats Americans consume were reduced by 80% but they are not totally removed from many foods. They are just harder to find. Reduced amounts of trans fats will be allowed until 2018. How many of these do you consume daily in French fries, pie crusts, and many more? Or even in processed foods with "only 1% per serving" when a serving is a very small amount and you consume a number of servings of that and other foods during the day. 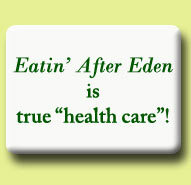 However, trans-fats are not the only concern about these perversions of the Creator's wholesome foods. Recall also that such and almost all store-bought, low-nutrient, highly refined polyunsaturated oils are all made of rancid oils with long shelf lives that may cause free radicals leading to cancer, CVD, diabetes, et al. These oils are heated to high temperatures, then deodorized. Our bodies were not designed to handle such toxins. 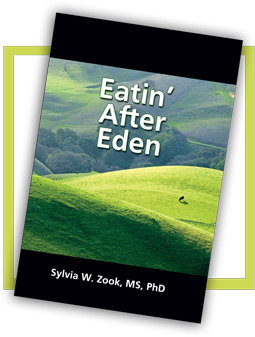 For the good news about nutrient rich traditional butter and other fats, treat yourself to all the interesting details in Eatin' After Eden. Begin today to enjoy butter, virgin coconut and palm oils. Educate yourself here and with this incredible book (see testimonials) as well regarding the dastardly fats and oils. Then you will never again need to look for "cholesterol free" labels. Share the facts with your friends who will thank you for this freeing truth!